I Mondiali, FIFA World Cup, is experienced as a very special event by all Italians, one that everyone knows not to miss. Even those who are not usually interested in the campionato di serie A, Italy’s national soccer league, become soccer crazy during the World Cup to support the Azzurri (the name reserved to the team) for the title of campioni del mondo, world champions: following the National team is a quasi-religious experience during the World Cup, when we gather together to watch the game in the streets, all wearing green, white and red (or the ubiquitous blue of our national teams!). This year’s World Cup will be a little tougher to watch, as matches will take place in Brazil, which is in a different time zone from Europe. This means that many of Italy’s matches will be late at night or at relatively inconvenient times but, despite this, Italians do not seem to be discouraged and are already getting ready for the event. 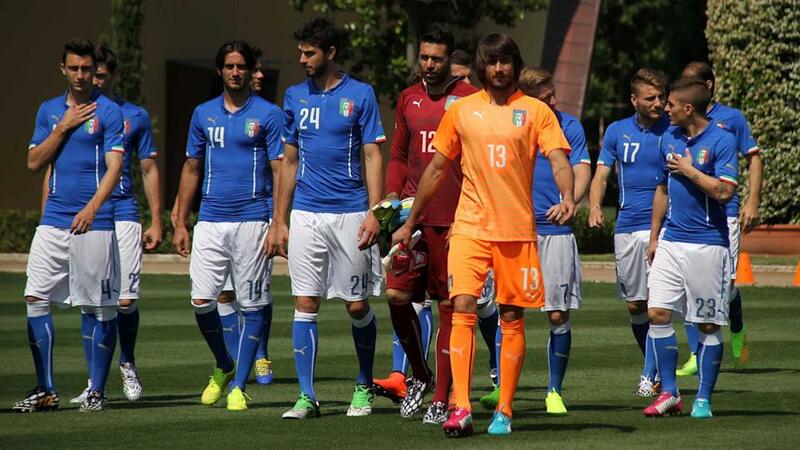 If you want to know everything on the Azzurri, the official FIGC website is a good place to start. ESPN will show the World Cup in the US, including all of Italy’s matches. When it comes to the game, Brazil and Germany are Italy’s major rivals: this is because they are, with the Azzurri, the teams holding the highest number of world titles. Brazil won the World Cup five times, whereas Germany succeeded three times. Italy, with its four trophies, lies just in between, one step from reaching Brazil, one step from being caught by Germany. However, it is not only to Germany and Brazil that Italy must pay attention to: Spain, the current world champion, is still on a winning roll, and South American giants like Argentina cannot be easily discounted. The Netherlands are also a great team to follow, as they rarely fail to impress: let’s not forget they reached the final in 2010. Italy will have to worry about these teams at later stages of the competition, though: our qualifying group is rather hard and will place the Azzurri against England (on the 14th on June), Costa Rica (on the 20th) and Uruguay (on the 24th). Let’s all keep our finger crossed for the Azzurri! Italy has won four World Cups, in 1934, 1938, 1982, 2006. The first two titles represented a great achievement as no team, except Brazil, had been able to win two consecutive titles. The first was won against Spain and the second against Brazil itself. The third world cup was won against West Germany and the fourth against France. 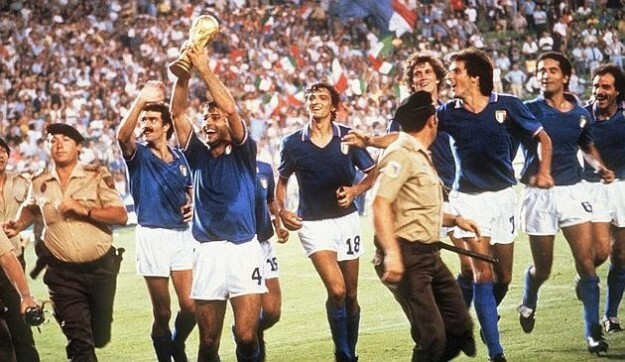 What is truly amazing about the Azzurri is that each of their games turn into a piece of legend and each World Cup becomes the righteous backdrop for their deeds, often associated to images, slogans and songs. The 1990 World Cup, hosted by Italy, is remembered as that of Totò Schillaci and Un’Estate Italiana, a very popular song interpreted by Edoardo Bennato and Gianna Nannini. The mascotte of the event, “Ciao,” was a simple puppet made up of green, white and red cubes, whose head was a soccer ball. Its name, hello, in Italian, was chosen by totocalcio players through a year long selection. È finita! È finita! È finita! È finita! Il cielo è azzurro sopra Berlino! Siamo campioni del Mondo! It’s over! It’s over! It’s over! It’s over! The sky is blue above Berlin. We are Champions of the World! Uttered by Marco Civoli at the end of the final against France, the phrase had all the epic allure and poetic licence (see the pun created by the color of our team’s jersey and that of the sky?) you may expect from an Italian: aren’t we said to be a nation of lovers, sailors and, alas, poets? E allora diciamolo tutti insieme, tutti insieme! Quattro volte: siamo campioni del mondo, campioni del mondo, campioni del mondo, campioni del mondo! Let’s say it altogether, four times: we are world champions, world champions, world champions, world champions! the Calci di Rigore that gave Italy its fourth World Cup. Skip to 11.10 for the now legendary last shot and Civoli’s cry of joy. A dispute also took place during the final match in 2006, which ended up with Zidane, the French captain, adored by French and Italian soccer fans alike, as he played for FC Juventus for many years, head-butting one of the Azzurri, Materazzi. What really happened in those few seconds is still not clear, although it seems pretty certain Materazzi said something offensive about Zidane’s mother, provoking the French champion’s reaction. The episode was, by many, considered the moment when France truly lost the World Cup, as Zidane was sent off the pitch then, missing the opportunity to take part in the penalty shoot out. However you want to see it, the Zidane-Materazzi’s diatribe became a mediatic phenomenon in Italy and France, where parodies, songs and even online videogames were dedicated to the event. Even if you don’t usually follow soccer, the World Cup is always a fun event to watch. As all international sport events, it manages to create a special type of interest and suspense, even if your country is not in it. Support Italy starting from next week and follow the Azzurri with us in Brazil, hoping we can all watch a blue-tinted final on the 13th of July, in the historical Maracanà of Rio de Janeiro. Un’Estate Italiana, the 1990 World Cup official song is background to some amazing shots of Italy as a World Cup champion.